By Gordon Frickers 50 x 76 cm (20″ x 30″), oils, original Sold to a private collector by A E Dutton & Sons (Gallery) of Chester. H.M.S. 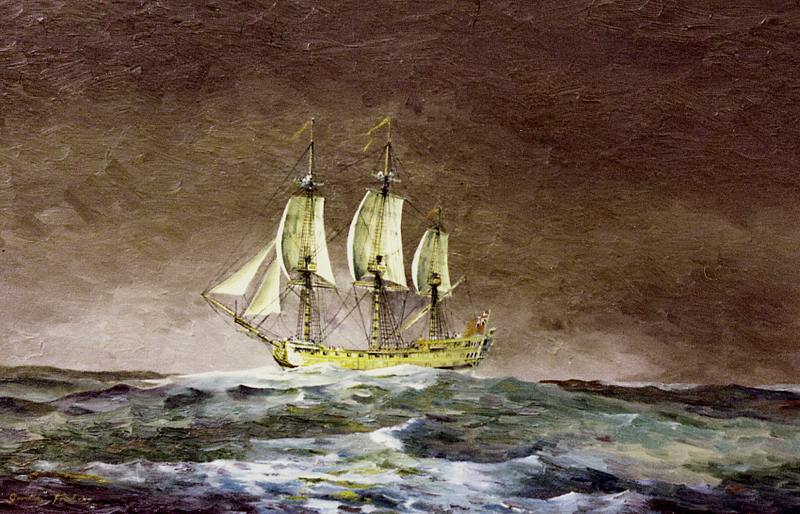 Centurion off Cape Horn; she was the first European ship to round Cape Horn in winter. Centurion and her men went on to capture the richest cargo ever taken at sea, and to be the first European warship to enter Chinese waters. The Chinese refused to believe she was a ‘Kings’ Ship’, they called her “The Great Pirate“. After almost unbelievable adventures the like of which even Hollywood would struggle with, it took 27 wagons to move her bullion treasure. 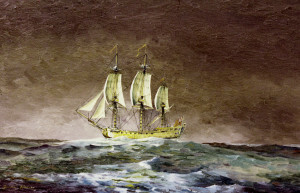 The painting is based on a model kindly made available to the artist by the National Maritime Museum, at Greenwich, London. Useful facts + excellent stories about [CF7_get_post_var key='title'].